Las Vegas, USA, 23 October 2017: Macate Group Corporation, an American multinational corporation, and its affiliate MiNiT Financial Services, Inc. today announced the launch of two new, innovative FinTech products at Money 20/20 in Las Vegas. The SPARX GATEWAY LLC and CardNet Alliance, in association with MiNiT Financial Services were created to help combat the growing rise in identity and online payment fraud, protecting consumers’ privacy and personal data when shopping online and collecting loyalty points. The SPARX GATEWAY LLC is a secure online payment processing gateway that enables consumers to safely shop online. All private consumer data is protected by MiNiT FS proprietary Bio Online Shopping Card, which is used for fingerprint enrollment via encryption partner BioPrint – ensuring consumers’ data is protected from online payment fraud. The CardNet Alliance, in association with MiNiT Financial Services is a secure loyalty membership scheme made up of luxury goods and service providers including airline lounges, private jet companies, luxury hotel chains and boutiques. 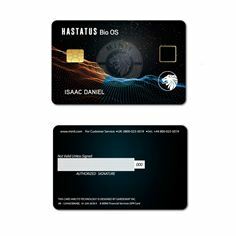 Members of the CardNet Alliance will be able to store their global membership loyalty points securely on one single card – The luxury Hastatus (High-class Affluence Status) Biometric Card, which allows points to be transferred, added and shared between partners, free of charge. For consumers who travel extensively across the globe, the CardNet Alliance enables instant confirmation of rewards across international waters as well as providing peace of mind that points and personal data are stored securely. MiNiT Financial Services, Inc., a Macate Group FinTech Company, will be exhibiting at Money 20/20 at Booth 1477. For more information about MiNiT FS FinTech offerings, please see here https://macate.com/gardevant. MiNiT Financial Services specializes in the development and issuance of secure identity and payment solutions based on biometric authentication. As an affiliate of Macate Group Corporation, MiNiT FS aims to provide best-in-class secure devices and applications to protect the privacy and data of all individuals and enterprises worldwide.